Porcelain -.50 oz size Airbrush Matte foundation for the most flawless traditional powdery finish, sheer to full coverage for ALL skin types. Oil-free, Mineral based, & NON-Harsh Preservatives. Makeup is long wearing and is designed for everyday use. Bloom -.50 oz size Airbrush Matte foundation for the most flawless traditional powdery finish, sheer to full coverage for ALL skin types. Oil-free, Mineral based, & NON-Harsh Preservatives. Makeup is long wearing and is designed for everyday use. Golden Beige -.50 oz size Airbrush Matte foundation for the most flawless traditional powdery finish, sheer to full coverage for ALL skin types. Oil-free, Mineral based, & NON-Harsh Preservatives. Makeup is long wearing and is designed for everyday use. Buff -.50 oz size Airbrush Matte foundation for the most flawless traditional powdery finish, sheer to full coverage for ALL skin types. Oil-free, Mineral based, & NON-Harsh Preservatives. Makeup is long wearing and is designed for everyday use. Fawn-.50 oz size Airbrush Matte foundation for the most flawless traditional powdery finish, sheer to full coverage for ALL skin types. Oil-free, Mineral based, & NON-Harsh Preservatives. 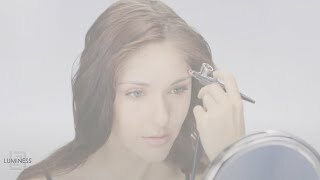 Makeup is long wearing and is designed for everyday use. Sun Kissed -.50 oz size Airbrush Matte foundation for the most flawless traditional powdery finish, sheer to full coverage for ALL skin types. Oil-free, Mineral based, & NON-Harsh Preservatives. Makeup is long wearing and is designed for everyday use. Cinnamon -.50 oz size Airbrush Matte foundation for the most flawless traditional powdery finish, sheer to full coverage for ALL skin types. Oil-free, Mineral based, & NON-Harsh Preservatives. Makeup is long wearing and is designed for everyday use. Chestnut -.50 oz size Airbrush Matte foundation for the most flawless traditional powdery finish, sheer to full coverage for ALL skin types. Oil-free, Mineral based, & NON-Harsh Preservatives. Makeup is long wearing and is designed for everyday use. Coffee -.50 oz size Airbrush Matte foundation for the most flawless traditional powdery finish, sheer to full coverage for ALL skin types. Oil-free, Mineral based, & NON-Harsh Preservatives. Makeup is long wearing and is designed for everyday use. Chocolate -.50 oz size Airbrush Matte foundation for the most flawless traditional powdery finish, sheer to full coverage for ALL skin types. Oil-free, Mineral based, & NON-Harsh Preservatives. Makeup is long wearing and is designed for everyday use. Espresso -.50 oz size Airbrush Matte foundation for the most flawless traditional powdery finish, sheer to full coverage for ALL skin types. Oil-free, Mineral based, & NON-Harsh Preservatives. Makeup is long wearing and is designed for everyday use. Java -.50 oz size Airbrush Matte foundation for the most flawless traditional powdery finish, sheer to full coverage for ALL skin types. Oil-free, Mineral based, & NON-Harsh Preservatives. Makeup is long wearing and is designed for everyday use. Luminess Air’s Matte Airbrush Foundation is a shine-free, weightless medium-to-full coverage foundation that delivers soft, even coverage with a freshly powdered velvety-matte finish. When you have oily or combination skin, you know the frustration of looking in the mirror mid-day and seeing your foundation slowly sliding off your face. With Matte, Luminess balances flat with flattering in a satin-smooth, breathable foundation that evens and enhances, eliminates shine and masks imperfections to reveal only your best assets. Matte is formulated with fine particles of kaolin, a naturally occurring mineral used for hundreds of years for its oil absorbency and skin soothing properties. Kaolin purifies your skin, clearing pores and soaking up excess moisture without causing flakiness or excessive drying. Mystic also contains anti-inflammatory neem extract and the moisturizing humectant glycerin. These natural ingredients keep your face looking fresh and healthy by improving your skin’s balance and reducing pore-clogging oils, dirt and environmental toxins. Makeup minimalists can simplify their morning ritual with a seamless finish in fewer steps. With just one light airbrush application, wrinkles instantly soften, pores minimize and flaws disappear, leaving you with a natural velvety effect and a matte finish that won’t fall flat. If you need more coverage, Matte’s superior blend-ability easily goes from medium to full coverage while still allowing your skin to breathe and your natural luminosity to shine through. Mineral-based, oil-free and hypoallergenic, Matte’s gentle formula is light enough for everyday use. Matte provides 10+ hours of transfer- and smudge-resistant coverage for a flawless, fresh-face sheen. This luxurious, all-in-one airbrush foundation was developed for the woman who wants medium-to-full coverage with a shine-free velvety finish. 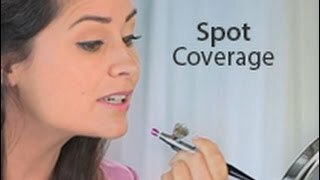 With just a few drops, Matte blurs imperfections including large pores, fine lines and wrinkles, redness, scars, birthmarks, blemishes, rosacea, discolorations and dark undereye circles. For those with acne-prone or problem skin, Matte is infused with neem extract which is known for its anti-bacterial, anti-inflammatory and anti-microbial properties. Neem extract contains antioxidant compounds that soothe inflammation and help defend your skin against age-promoting free radicals. Matte is best for oily to combination skin types and provides exceptionally powder smooth coverage in a range of skin-matching shades. I love my Airbrush Matte Foundation in Fair Shades 2 & 3. I have oily skin, so I did not want to use the other foundations that may have a bit more sheen and glow to them. I wanted a powder, non-shiny, matte look, but of course full coverage to ensure my acne is covered. Works wonderfully! Completely flawless, full coverage. Goes on even. One of the best parts, is I don’t have to use my hands, sponges or brushes to apply my makeup. Which is not ideal for breakout prone skin! 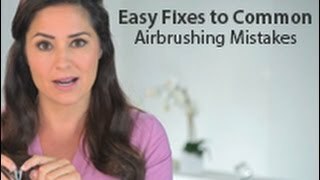 I use the airbrush system to gently spray my makeup on for not just a flawless look, but a healthy look. The foundation is healthy for your skin. Oil free, paraben free, water based, and not tested on animals. Love it! BEST FOUDATION EVER!!! I have greasy skin and the Matte foundation does wonders to keep the shine down on my face! I tell everyone I know about this amazing product. I love my luminess air brush system but the foundation that it came with didnt match my skin tone. But overall a wonderful product! Absolutely love the Airbrush Matte Foundation, it matched my skin color complexion perfectly. The coverage is more than what I expected. Love it!!! Love how the color matches my skin . Feels like I'm not wearing any make up . So easy to use. Rosecea, large pores, oily AND flaky dry skin and at 43, I break out like I'm still 16! A life-threatening hysterectomy at 35 did not help my skin. BUT for the first time since before I was a teen, I am actually having "good-skin days! I have had the system for about 6 months and I mix 2 shades. I don't wear makeup every day, but have been more and more because Luminess is so FAST & EASY! The redness is eliminated especially well with the Eraser. And I always use the moisturizer. I just purchased the sealant to try this summer. And I'm reordering! ME! Happy with a cosmetic! Thank you LuminessAir! I love the Matte Foundation. I have normal/oily skin and this stops the afternoon oily shine. I started using Luminess in September 2016 and so happy with the results. I love the way it allows you to have thin coverage or heavy coverage and still looks very professional. I'm in my 50s now and this make up is really good at hiding small lines and wrinkles. Also, my face changes color a bit with each season. Now, instead of having many bottles of different color foundation, I use two, the whole year. My main color is Porcelain and my secondary color is #3. I add a drop or two of my secondary color to make Porcelain a bit darker and adjust for each season. It is Perfect for me. I'm so glad I changed to LuminessAir and will continue using it. I love this makeup. I am 70 years old and I am constantly receiving compliments on my makeup. I mix Shades 3 & 4 to get the perfect color and coverage. It looks like I'm wearing the shearest coverage with no caking, like nothing at all, but I'm glowing. I love this Airbrush system. I love this makeup. I am 70 years old and I am constantly receiving compliments on my makeup. I mix Shades 3 & 4 to get the perfect color and coverage. It looks like I'm wearing the shearest coverage with mo caking or creases, like nothing at all, but I'm glowing. I love this Airbrush system. I love this makeup. I am 70 years old and I am constantly receiving compliments on my makeup. How it looks like I'm wearing nothing at all, but I'm glowing. Sorry I waited so long to use Luminess Airbrush system.